Why risk relying on the season for good cheer? Rachel notes: If you listen to the recipe I describe, you'll see this incredients list is not exactly correct. This is a case of do as I say, not as I... show? You take equal parts of honey and water. You heat them up a little bit on the stove so you get kind of a thin honey syrup. Then, in a mug or a thick glass, put in half ounce or maybe an ounce of your honey syrup. Put in half an ounce of dark rum, half an ounce of bourbon, half an ounce of fresh lemon juice, and then you top it off with about three ounces of hot water out of the kettle. Stir those around a little bit. Put a big, thin-cut piece of lemon peel on top for garnish. 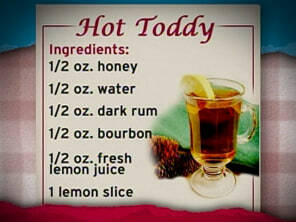 And what you have there is a toddy - a hot toddy.